Jensen is certified Personal Trainer with over 10 years of strength and conditioning experience in the industry. He is also a physical therapist for children with cerebral palsy. He completed his degree in Exercise and Sports Science from Edith Cowan University and became certified as a Certified Strength and Conditioning Specialist® (CSCS) with the National Strength and Conditioning Association (NSCA). As an avid cyclist and football player, fitness is an integral part of his day-to-day life. He was drawn to how our body changes through proper training and nutrition. Human anatomy and physiology are both his favourite topics. Although there is still so much to be researched on health and fitness science, he is 100% motivated in helping clients to achieve their personal goals from all walks of life. After having years of personal training experience in the fitness industry, Jensen decided to learn more and upgrade his knowledge even further. He proceeded on as a sports science lecturer in a tertiary college. 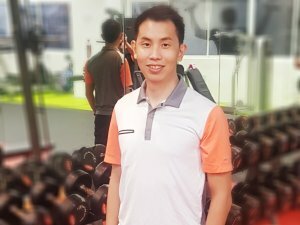 Jensen worked as a sports science lecturer in ITE college central (AMK) from 2014-2018. During his teaching career, he was able to transfer his knowledge and passion to students at the technical college. Being a sports lecturer/coach for 4 years in a tertiary school has given him the opportunity to explore deeper into exercise science, widening his knowledge and experience in sports performance. Currently, he decided to shift his focus and continue his research in musculoskeletal disorders. It was something that he always wanted to specialise in, hoping to do his part as a rehab specialist for patients that suffers from disorders such as cerebral palsy. In the past decade, there is a growing recognition of exercise rehabilitation for the special population such as the disabled and physically challenged patients. Jensen believes that physical activity and manual therapy plays an important role in stimulating the motor activities for the development of the central nervous system pathways for his clients. The key is to improve their health functions post injury, stimulating the nervous system of their body. Although the process is challenging, it is definitely more satisfying, giving himself a greater sense of fulfilment as a therapist. Right now he is working with a group of children with cerebral palsy, providing them with various treatment options. He is one of the first person in Singapore to use Advanced Biomechanical Rehabilitation (ABR) approach on his clients. At PT works, treating our clients health issues are our main priority. For Jensen, he choose to take on a more challenging task. Training clients with special needs require more focus and patience. But it was all worth it. Striving to make training accessible and enjoyable for all his clients and pledged to make a positive difference in their life. That’s the promise he make with them. Besides training the special population, Jensen also frequently conduct athletic sessions for people who wants to excel in their sports. These are either 1-1 strength and conditioning or group training with sports team for optimal sports performance. With a vast experience working with tertiary sports teams and sound knowledge on human physiology, Jensen also hold talks on topics such as neuromuscular activity, nervous system pathways and biomechanics. He is our speaker for general health and nutrition too. Please don’t hesitate to reach out to him and discuss how we can work together to transform your body. Contact us for trial class!